The month of February has been very busy, due in part to the annual Book Fair and the many personalities passing through Cairo. We were impressed by the renewed vitality of Arab publishers, especially of the Iraqis and Syrians. 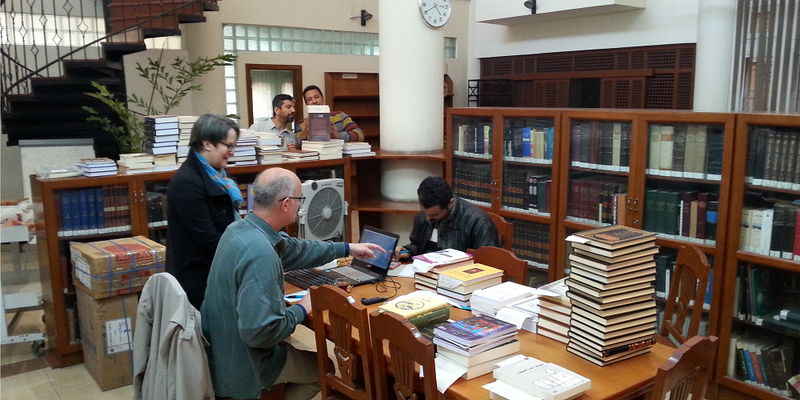 We were also able to obtain many classical Arabic texts and have very nice encounters. It would seem that the Cairo Book Fair confirms its central position in the market of the Arabic-Muslim heritage texts. On February 3rd, Emmanuel Pisani, OP gave a lecture entitled “Interreligious Dialogue: Challenges and Perspectives”, as part of the educational days of the diocese of Tours. On February 4th, Amir Jajé, OP took part in a round table entitled “Commit to Eastern Christians: What is the place of the interreligious dialogue in establishing a society of peace in the Middle East?”, organized by the French Catholic organization Œuvre d’Orient as part of the Ecclesia Campus (Lille). On February 6th, Adrien Candiard, OP gave a lecture on his book Comprendre l’islam, ou plutôt : pourquoi on n’y comprend rien (Paris: Flammarion, 2016) at the Dominican priory in Bordeaux. On February 6th, Rémi Chéno, OP gave a lecture entitled “The challenge of the plurality of religions”, the topic of his book Dieu au pluriel (Paris: Cerf, 2017), in Agora-Tête-d’Or in Lyon. He repeated this lecture in English at the Dominican priory in Lund (Sweden) on February 16th, and again at the Dominican priory in Strasbourg on February 19th. On February 9th, Emmanuel Pisani, OP and Marco Dimichelis led an ISTR research seminar entitled “Islam and Otherness”. From February 19-23rd, Emmanuel Pisani, OP took part in a session of Islamology entitled “Prayer in Islam”, at Notre-Dame de Vie in Venasque. On February 28th, Emmanuel Pisani, OP led a seminar entitled “Al-Ġazālī between criticism and apology of philosophy or how the philosophy is convened for its theological-political projects”, at the ENS in Lyon. On February 26th, Dennis Halft, OP was appointed as a postdoctoral fellow of the Martin Buber Society of Fellows in the Humanities at the Hebrew University, Jerusalem, from the academic year 2018/19 onwards. The Martin Buber Society of Fellows, a joint venture of the Hebrew University and the German Federal Ministry of Education and Research, aims at fostering inter-disciplinary and inter-cultural academic discourse at the highest level among outstanding young scholars from Israel and Germany together with selected senior colleagues. On February 1st, we welcomed for lunch Mr. Ali Benmakhlouf, philosopher, who was invited to Egypt by the French Institute. On February 2nd, we welcomed for lunch Mr. Frédéric Bauden, specialist of Arabic manuscripts at the University of Louvain, who was invited to Egypt by the IFAO. On February 4th, we welcomed Mr. Sarhan Dhouib, philosopher at the University of Kassel in Germany, who was invited to Egypt by the Cairo University. On February 15th, we received the visit of Mrs. Carla Thomas, from the British Foreign and Commonwealth Ministry, who carried-out a mission to Egypt. On February 16th, we welcomed for lunch Mrs. Nadirah Mansour, PhD student at the University of Princeton, USA. On February 19th, we welcomed for lunch Mrs. Helen LaFave, Minister-Counselor of the United States Embassy in Egypt, and Mrs. Elaine Jones, Political and Religious Affairs Officer. On February 20th, we welcomed for lunch Mr. Tomás Guardia, Ambassador of Panama in Egypt, and Mrs. Julissa de Hoyos, Minister-Counselor. On February 27th, we received the visit of Mrs. Inessa Beloglazova, Professor of Arabic at the Federal University of Kazan, Tatarstan, Russia. In February, we had the pleasure of receiving at the Scholars’ House Mrs. Sadia Agsous, post-PhD fellow at the École des Hautes Études en Sciences Sociales in Paris.